Tech Parks Arizona recently led a business mission to Israel. This business outreach trip was part of Global Advantage, a business development program designed to attract fast growth technology companies to the Arizona-Sonora Region. A delegation from Tech Parks Arizona representing the Global Advantage Soft-Landing Program spent a week in Israel meeting with thirty-four Israeli small to mid-size technology companies. The technology companies operate in the following technology sectors: advanced energy, cyber-security, digital healthcare, robotics and smart vehicles, as well as arid lands agriculture and water. These companies are ready to expand to larger markets, and Tech Park Arizona’s goal is to have the North American launch of these businesses take place in Southern Arizona, with its easy access to major American markets as well as northern and western Mexico. Four companies have already expressed an interest in joining the Global Advantage program. The delegation also presented two seminars in Israel, on the North American Market Opportunities for companies in Advanced Energy and Intelligent Transportation/Smart Vehicle sectors. Members of the delegation also met with Israel Advanced Technology Industries, the U.S. Commercial Services, business accelerators and venture capitalists. During the second week of the business outreach mission, the Tech Parks Arizona delegation was joined by representatives from the University of Arizona (UA) and Universidad Nacional Autónoma de México (UNAM). The University of Arizona (UA), Universidad Nacional Autónoma de México (UNAM) and Ben-Gurion University signed a joint agreement during the meeting in Israel. 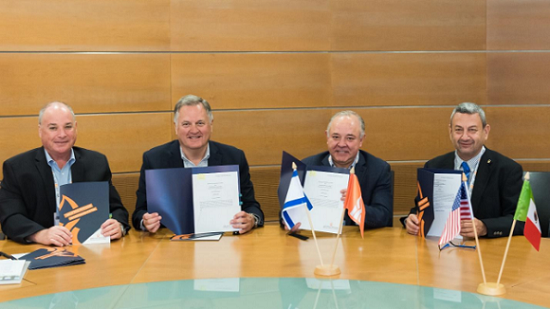 The agreement includes areas of innovation and entrepreneurship, as well as plans for academic ties and cooperation between Ben-Gurion University's high-tech park, Tech Parks Arizona and the high-tech initiative of UNAM. Through the framework of the trilateral cooperation, emphasis will be placed on encouraging innovation, developing joint projects, cooperation between technology transfer organizations of the academic institutions, joint development of industrial relations, and development of links between the tech parks and high-tech initiatives at the universities. The three institutions, which share a common focus on innovation as well as similar climates and will now share expertise on how to overcome common challenges. Established in 1885, the University of Arizona, the state's super land-grant university with two medical schools, produces graduates who are real-world ready through its 100% Engagement initiative. Recognized as a global leader, the UA is also a leader in research, bringing more than $606 million in research investment each year, and ranking 21st among all public universities. The UA is advancing the frontiers of interdisciplinary scholarship and entrepreneurial partnerships and is a member of the Association of American Universities, the 62 leading public and private research universities. It benefits the state with an estimated economic impact of $8.3 billion annually. The University of Arizona is the state's super land-grant university with two medical schools, produces graduates who are real-world ready through its 100% engagement initiative. Recognized as a global leader, the UA is also a leader in research, bringing more than $606 million in research investment each year, and ranking 21st among all public universities. Tech Parks Arizona creates the “Interactive Ground” that generates, attracts and retains technology companies and talent in alignment with the research, mission, and goals of the University of Arizona (UA). Tech Parks Arizona directs the UA Tech Park, the UA Tech Park at The Bridges and the Arizona Center for Innovation, placing the highest priority on recruiting companies desiring connectivity to the University of Arizona. Tech Parks Arizona is part of Tech Launch Arizona (TLA), an office of integrated teams creating an ecosystem of invention and commercialization throughout Arizona and beyond. Universidad Nacional Autónoma de México (UNAM) was founded in 1910 as the basis of Mexico’s national university which was founded in 1552 and is ranked 122 in the world on the QS Ranking and among the top 50 in the fields of the arts, soil engineering and geology, archeology and more. The university boasts three Nobel Laureates. UNAM has a student body of approximately 250,000 in more than 40 faculties and schools; there are around 30,000 graduate students on six campuses in the Mexico City area. The Ben-Gurion University of the Negev is the fastest growing research university in Israel, fulfilling the vision of David Ben-Gurion, Israel’s first prime minister, who envisaged the future of Israel emerging from the Negev. From medicine to the humanities to the natural sciences, BGU conducts groundbreaking research and offers insightful instruction. The University is at the heart of Beer-Sheva's transformation into the country's cyber capital, where leading multi-national corporations leverage BGU’s expertise to generate innovative R&D. A third of Israel’s engineers graduate from BGU, with that number destined to rise as the IDF moves south and sends its brightest to swell the ranks of BGU’s student body. To accommodate that growth, BGU has launched an ambitious campaign to double the size of its main campus. As it counts up to its fiftieth anniversary, the University's research becomes ever more relevant as its global reach broadens.